A Pew survey shows that Americans haven’t made up their minds whether public libraries should cut back on prime display of paper books to make way for other uses. The survey mentioned meeting spaces as alternatives. Another almost surely would be makerspaces. Some ebook boosters might think of an already-all-digital library and be tempted to say, “Go ahead. Out with the paper books!” I myself love what Bibliotech is up. But as a literacy booster, I would say, “Not now in most situations!” We first need better ebook technology as well as more teaching of ebook literacy, so public library patrons will feel more comfortable with the tech. Typical patrons don’t know how to deal with such issues as screen glare. Nor how to navigate through ebooks and get a general sense of them as easily as they can of paper books. Yes, this is the ebook era in the sense that millions of people love E. But for now—the future is different—paper is still the main show. Beyond that, let’s consider the needs of younger children, who may fare better with paper books. I see them as gateways to the electronic versions, and the physical presence of books can help keep them on the kids’ minds, whether the books are at home or at the library. Yes, the Definitely Nots (31 percent) beat out the Definitelys (24 percent). But then if you add the Maybes (40) to the Definitelys, the total is 64 percent. That should be of interest to paper book stalwarts even if the Definitelys are down from the 30 percent in a similar 2015 survey. Notice the 80 percent in favor of more programs to tell people how to use digital tools? That certainly would tie in well with TeleRead and LibraryCity’s advocacy of cell phone book clubs, as well as the creation of a national digital library endowment. 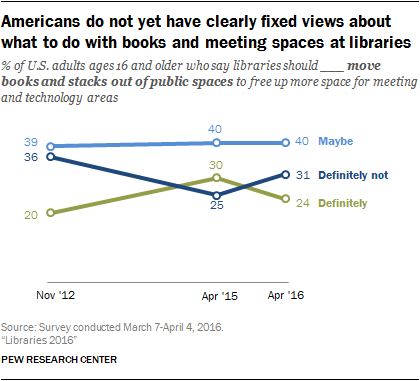 Pew led the survey summary with: “Most Americans view public libraries as important parts of their communities, with a majority reporting that libraries have the resources they need and play at least some role in helping them decide what information they can trust.” The “important parts” is old news. As for resources, I wonder if the survey respondents have thought that through. Public libraries can spend only about $4 per year per capita on books and other content of all kinds, both digital and electronic. I do not find the eBook browsing experience to be anything approaching satisfactory. Browsing through the stacks works better for me. Maker Spaces? Come on now. They can be noisy and smelly, not the library experience I am looking for. My primary library has plenty of comfortable reading areas. Including 8 comfy chairs around a fireplace. Tables to work at. Plenty of outlets to plug in electronics. Study Rooms. Meeting rooms. I wish they had a small beverage and pastry concession on site. There are maybe 4 dozen computers to use. I like that mix and wouldn’t want to see it change much. On the other hand I am of an older generation, and while I do not think I am hidebound to the old ways, would I realize it if I were? @Dana: I agree! OverDrive’s interface is slow–horrible for serious browsing. This is fixable. As for maker spaces, they’re not high on my personal list. But, yes, it’s an age thing. Libraries need to serve many people beyond Dana and David. @Frank: Exactly! Care to write a short post mentioning the Adler book and updating it in an ebook context? Just the basics. Furthermore, the types and amount of library services to be provided in a community has to be balanced to serve all of the clients. You can’t just say that the majority rules, so if 60 percent of the clients want paper books then there will be no eBooks or meeting rooms at all. I care less and less these days about what ‘Pew Research’ has to say. I am usually dissatisfied with the questions they ask. I guess I have low expectations. The Overdrive app has worked great for me. I am all in with ebooks. Recent loans have included Daniel Silva’s “The Black Widow and “Girls of Atomic City” by Denise Kiernan.